Meanwhile, a sorceress manipulates the most powerful men in Galbadia. 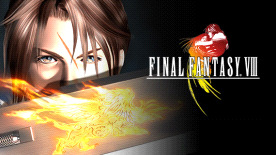 Squall and Seifer are forced to cooperate on a mission to assassinate the sorceress. Will they succeed in putting aside their differences, and end the war that has ravaged their planet? What part does the mysterious Laguna play? Only you can decide what happens next, as the greatest Role Playing Adventure of all time returns.."
CAUTION, certain computers may not be able to process the game with High Speed Mode. If the game crashes while in High Speed Mode, please restart the game and refrain from using High Speed Mode.